Abingdon, Va is a beautiful, quaint town in southwest Virginia. It has terrific restaurants, walkable streets, and a craft brewery. For my family, we go to Abingdon for two reasons: biking the Virginia Creeper Trail (a 34 mile rails to trails pathway) and hiking the trails at Grayson Highlands State Park, famous for its soaring views and wild ponies. In this two night itinerary, you will spend the first day biking the beautiful Virginia Creeper Trail and exploring the local towns. On the second day, you’ll hike and explore my favorite Virginia state park, Grayson Highlands. Day 1- Bike the Creeper Trail (plan at least 2.5-3 hours), enjoy dinner in Abingdon at The Market: Homegrown Burgers and Brews. Day 2-Breakfast at Balkan Bakery in Abingdon and pack a picnic for your hike to Wilburn Ridge on the Rhododendron Trail at Grayson Highlands State Park. Afterward, enjoy ice cream floats at Ellis Soda Shoppe and dinner at Bonefire Smokehouse or 128 Pecan. Day 3-Before hitting the road, try breakfast at Zazzy Z in Abingdon or Mojo’s Trailside Cafe and Coffee House in Damascus. 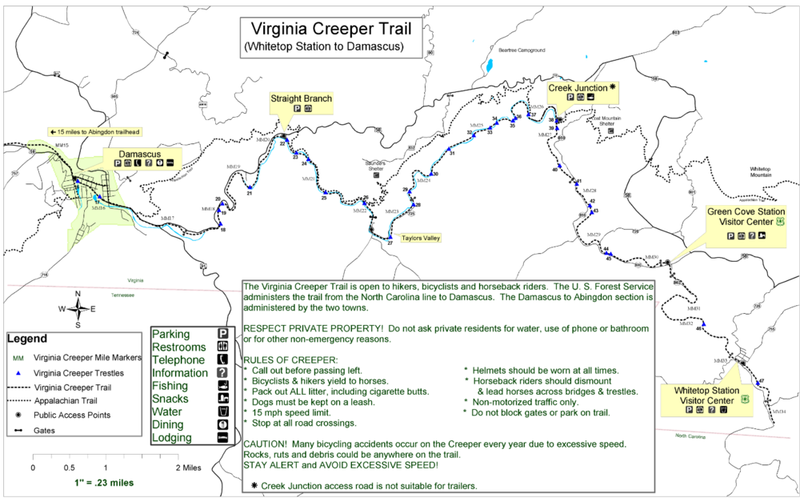 You have 3 locations to choose from: Abingdon, VA; Damascus, VA; and Whitetop, VA. Each of these towns has access to the 35 mile long Creeper Trail but varies with its amenities with Abingdon offering the most. However, the drive from Abingdon to Grayson Highlands State Park will also be the furthest (a little over an hour). Each of these properties is located in historic downtown Abingdon. You can stroll the town and walk to many restaurants. The access to the western end of the Creeper Trail is within blocks and the drive to Grayson Highlands State Park takes about an hour. 1) The Martha Washington Inn, an attractive and historic hotel, is the place to stay for a memorable but expensive experience. If you can book on a weekday, you will get a less expensive rate. Also, check out the package deals that includes lodging and biking the Creeper (if you need a shuttle or rental bikes). 2) Hidden Historic 12 Acres In Downtown Abingdon, Walk To Everything. VRBO 865242. 3 bedroom, 1 bath with a nice yard. 3) Historic District - WINTER RATES - 4 Blocks from Creeper Trail & Barter. VRBO 263454. Conveniently located a few blocks to the Creeper. Sleeps 4-6. 4) The Virginia Creepers End Cottages consists of two cottages with a total of 5 units which hold either 1 or 2 bedrooms in each. You rent one of the units. The hotels that dot I-81 near Abingdon are generally a less expensive option, but you will have a longer drive to the places on this itinerary. Damascus, VA is a small town and a popular resting spot for thru-hikers of the Appalachian Trail. It is located 20 minutes east of Abingdon and roughly 50 minutes from Grayson Highlands State Park. It has limited restaurants but the access to outdoor hiking and Creeper is amazing. 1) Damascus Old Mill is a private inn with full service restaurant and pub on the banks of the Laurel Creek overlooking Old Mill waterfall. 2) Right On The Creeper Trail! Your Very Own Vacation House In Downtown Damascus. VRBO 801968. A new 3 bedroom cottage located right on the Creeper Trail. 3) Quaint and Cozy Cottage in Damascus. VRBO 639928 A 3 bedroom farmhouse walkable to the coffee shop and bike shop. Beautiful timber frame home with spectacular mountain views. Secluded, fabulous. VRBO 331484. If you really want seclusion, check out this cabin that sits on 50 acres atop of a ridge. We stayed here and it was perfect. It was clean and cozy and the pictures don’t do it justice. It’s location is terrific for exploring the trails at Grayson Highlands State Park (3 miles to the entrance) but it’s a bit further from the Creeper Trail depending on where you access it. Closest restaurants are 25 minutes away in West Jefferson, NC. The star gazing was wonderful here. Note: 4-wheel drive recommended for the gravel driveway leading up to it. Also, it has two baths but just one shower. We would definitely return here. If you are comfortable camping, checkout the campground in Bear Tree Recreation Area. It’s a good location to experience Grayson Highlands State Park and the Creeper Trail access from Damascus, VA. It’s a 40 minute drive from Abingdon; 41 minutes to Grayson Highlands; and 20 minutes to Damascus. Grayson Highlands State Park also has a campground, but we wish the sites were more private. Its location can’t be beat though. With about 100 trestles and bridges, sharp curves and steep grades, the Virginia Creeper traverses 34.3 miles from Abingdon, VA through farmlands to Damascus, Va and finally ascends 1,600 feet on a nearly 7 percent grade to the Whitetop Community at the Virginia/North Carolina border. The trail surface varies but is mostly crushed gravel easily navigable by regular kid bikes and mountain or hybrid bikes. Most people bike one section of it: 1) Whitetop to Damascus (mountainous descent) or 2) Abingdon to Damascus (relatively flat, pastoral, and scenic). Check out more information here including the elevation profile or click here for an Info Guide and Trail Map. You can rent bikes from an outfitter and get shuttled to Whitetop for the 17 mile downhill section of the trail to Damascus (plan about 2 hours for this). If you bring your own bikes, you can pay for the shuttle only. For this section of the trail, you may not even need to pedal- just coast down. This is the most popular route and can be crowded on weekends. Contact Adventure Damascus for bike rental and shuttle information for either section of the Creeper. Reserve ahead of time if you can. They can fill up on weekends. You can also rent bikes in Abingdon from the Virginia Creeper Trail Bike Shop. The other option (and my favorite) is to bike from Abingdon to Damascus. This is a relatively flat 15 mile ride through farmlands and over long trestles. The elevation in Abingdon is about 2000' and you drop to 1770' at the trestle over the Holston at mile 7.8 from Abingdon. Then it's a very gradual gain as you come into Damascus, elevation 1910' at mile 15.5. This section of the trail will be hot in the summer, so start early. Access the trailhead on Green Spring Road and bike 8.5 miles to Alvarado Station for lunch, drinks, or snacks. This spot makes a nice half-way stopping point between Abingdon and Damascus. This could also be your end point where you can turn around and bike back to Abingdon after eating lunch. From Abingdon, you can also simply choose to bike for as long (or short) a distance as you’re able and turn around. It’s fun and beautiful whether you go 2 miles or 34. 0 (33.4) Abingdon Trailhead: Limited parking. 15.5 (17.9) Damascus: The red caboose is a seasonal information station. Parking, restrooms in town park. Snacks, etc. in town. 17.5 (15.9) Iron Bridge: Enter Mount Rogers National Recreation Area. 19.5 (13.9) Straight Branch parking lot. 21.0 (12.4) Taylor's Valley: Parking. 25.0 (8.4) High Trestle: 550 feet long, about 100 feet tall. 29.3 (4.1) Green Cove Station: Seasonal Forest Service information station. Portable toilets. Parking. Drinks and water when open. 32.3 (1.1) Whitetop Station: Highest point on trail. Parking. 33.4 (0.0) VA-NC border: Land on the North Carolina side is private property and most of it is posted. It is NOT a trail. According to the Forest Service, there are three visitor centers along the trail: one at the Damascus Caboose, the old Green Cove Station, and the rebuilt Whitetop Station. All are open weekends May-October. Bathrooms are available at the Abingdon parking lot, Alvarado parking lot, in Damascus near the caboose, Straight Branch parking lot, Creek Junction parking lot, Green Cove train station, Rt 677 parking lot, and Whitetop train station. Refreshments can be purchased at several places along the trail in Abingdon, Alvarado, Damascus, and Taylors Valley have businesses that offer refreshments. Bottled water and drinks are for sale at Green Cove on weekends from May-October. Free water is available at Whitetop Station during frost-free months. The only public phone along the trail is in Damascus. Cell coverage is poor. Alvarado Station is a small restaurant/convenience store serving breakfast and lunch. Bike 8.5 miles on the Creeper Trail from Abingdon. 21198 Alvarado Rd. It would be a good idea to call ahead of time for their hours. 276-475-5799. Mojo’s Trailside Cafe and Coffee House. We had breakfast here and it was terrific. Lunch menu looked good too. A cozy place to relax and refuel. 331 Douglas Dr.
Off the Beaten Path Ice Cream Shoppe. Located at 409 Fritz St.
Damascus Brewery (no food) is located at 32173 Government Rd. Food City is the closest grocery store to Damascus and Whitetop. 736 N Beaver Dam Ave. The Market: Homegrown Burgers and Brews. Return to Abingdon to eat at a local restaurant that invites you to “kick back, relax, and enjoy it straight from the farm!” Kids menu available too. Located off the “main drag” at 1220 West Main St.
Balkan Bakery and Zazzy Z’s are both located at 380 E. Main St. Abingdon. Enjoy European-style baked breads and desserts at the Balkan Bakery. Good croissants, coffee, and filo dough pastries stuffed with savory ingredients. After breakfast, order a “to go lunch combo” from Zazzy Z’s next door to Balkan Bakery to enjoy at Grayson Highlands. Open 7:30am weekdays, 8am Saturday, and 9am Sunday. From Abingdon, drive 50 minutes to Grayson Highlands State Park. Note that there is a $4-$7 entry fee. Head to the Visitor Center to get your bearings and learn about the park. Our family likes to hike the roughly 1 mile trail to Wilburn Ridge. It has beautiful 360 degree views and some fun rock scrambling. Park at Massie Gap and follow the Rhododendron trail. Be on the look out for the wild ponies that roam here. If you want to keep hiking, the trail intersects the AT where you can hike as long as you’d like then return. Also note, that it is usually cooler and windy here due to the open balds and high elevation. Check the weather forecast before starting the hike. This is my absolute favorite place to hike. Tip: Apparently, geocaching is popular here if you’re into that! Abingdon boasts its own local brewery, and they are brewing some fine beers. Wolf Hills Brewery at350 Park St. is close to downtown Abingdon. They typically don’t serve food but you might be lucky to find a food truck or you can bring your own snacks. See map on page 11. Abingdon is also known for its famous and historic Barter Theater. It opened in 1933 making it the nation’s longest running professional theater. It offers live theater all year round if you are interested in checking it out. Kroger, open 24 hours, is a full service grocery store located close by at 466 Cummings St. in Abingdon.